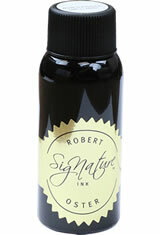 The Robert Oster 1980s Colours ink is a conglomeration of all sorts of color influences. From the heady uber disco lights to the subdued pastels of the 80s. The anything goes world from the 1980s has inspired this collection of inks. The Robert Oster 1980s Colours(50ml) Fountain Pen Ink usually ships within 1 business day unless otherwise specified. Each Robert Oster 1980s Colours(50ml) Fountain Pen Ink we sell is guaranteed to be genuine, authentic and will arrive brand new & unused! I bought Dusty Pink. It's a bit paler than I normally like (my eyes were straining a bit to read what I'd written when I switched to an extra-fine nib), but it is a beautiful color. The soft, mauvey pink tone is understated and sophisticated in my opinion (at least compared to more vibrant or true pink shades). Performs well. I bought a couple of bottles:Honey Bee and Bass Straight. Both are beautiful colors; Bass Straight even has some sheen. It didn't take long to empty out the Honey Bee in my Eversharp Skyline. I would buy these two inks again. Unfortunately, no these are not waterproof inks. It is a 50ml bottle of ink.